Amazingly, at last I am done with the African Trilogy. 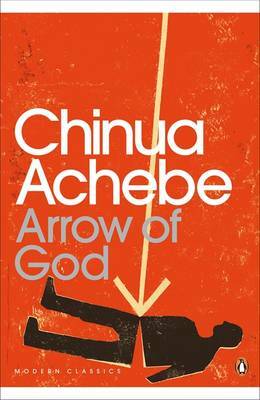 On the post face of the novel was written that "Arrow Of God" is a continuation of the epic saga of the community in Things Fall Apart, second volume of Achebe's African trilogy and is followed by No Longer At Ease. I was for a moment bewildered because I thought I was reading the saga the wrong way round. Nonetheless, in many official book website it was clearly indicated that this novel is the last part of the saga. It made sense because it was published five years after "No Longer At Ease". Anyhow, you do not need to read these novel in a sequel in order to understand and therefore enjoy them. To start with, Arrow of God is my least favourite of them all. At a point I doubted if I was reading a story or perhaps a narrative of the Igbo Culture (of which I am proud of). Do not get me wrong. To my way of thinking, this part of the trilogy was unattractive compared to the previous ones. I somewhat felt it was a sequence of events whence you need to grab the information however it pleases you. Moreover, most of the conversations were held in proverbs. In fact, if you want to insight yourself on Igbo proverbs this is the book to read. At the same time, I have to admit I enjoyed most of the proverbs because I grew up hearing them from my relatives (in Igbo of course). Albeit, until present I still do not understand the meaning of some of them. For instance "A toad does not run in the day unless something is after it", I can recall exactly the way it is said in Igbo, even so, this is a proverb I am yet to comprehend. Why shouldn't a toad run in the day time? In any case, I do not want to divert so much from my book review. Chinua once more wrote about the changes suffered in Eastern Nigeria due to the influence of the white man. The story is about Ezeulu a chief priest of the God of six villages who, with the presence of the European was finding it difficult to demonstrate the power and relevance of the god of the land. He was accused of desecrating the land by sending his son to the Christian school in his village and to church to worship the European god (another god). Certainly, the ending of this book was quite unlooked-for and appalling, typical of Chinua Achebe's. I felt a little distressed. Finally, I understood and learnt that changes are persistent and preordained. The Igbo Culture is no exception, with or without an outside effect, it would have surely gone through transition indeed. Do I recommend this book? Well, yes! Especially if you are reading it as part of The African Trilogy. Mary, I read the Arrow of God and I loved it. Indeed, it was a profound reading and I was moved by the efforts of Ezeulu to hold his place in a culture that was fast losing confidence in his abilities to lead them spiritually. Like you said, sending his son to be trained by the missionaries was viewwed as a betrayal on his part, to the ideals of the igbo culture. I do agree with you that the ending was truly a let down, but I enjoyed the novel so much, proverbs included. Excellent review, Mary. Thank you for your concern and support, Mary. I am highly appreciative of it. I am doing well under the circumstances. Poppy is still in a critical state. God is in control. Celestine, thanks for stopping by. God is sure in control. I am delighted I am done with the The African trilogy. I far enjoyed No Longer At Ease than Arrow of God... probably it is a book I have to read some time again in the future to get a better understanding. Nonetheless I like the novel. Kboy, thanks a lot for the exegesis. It is so enriching. Now,I remember once my grandmother gave me that explanation. I also recall that once as a kid I walked behind a frog in the day time to find out what it was after or vice versa (LOL I did not find out). Poor frog, it always hops under shelter during the day time. I don't blame them. I have completely forgotten how scorching the sun could be in that part of the world. One of my favourites of Achebe. Lovely review. Thanks, Geosi. it was a bit too much for my taste. I got the message anyway. Love Chinua Achebe, after reading the African Trilogy somehow i felt more African..Anyway, i do prefer the second book though...So i hope there is a review on that one...cant wait to see it...oh, nice blog! Arrow of God is a strong novel, there is a lot to learn from it. However, I am of the opinion that it is a novel we should read again when we are a bit more matured. Achebe was talking about something big in it. You know, how colonialism was surreptitiously getting rid of other people's belief and tearing them apart. And how the people reacted.